Between the recent solar eclipse and the astrological shift from Leo to Virgo, just about everyone is feeling the need to get their shine on. We're totally here for it... glow all the way up, no matter your astrological sign. And if you're headed out tonight (or in the near future), your mission—should you choose to accept it—is to step fiercely and sip sparkly. 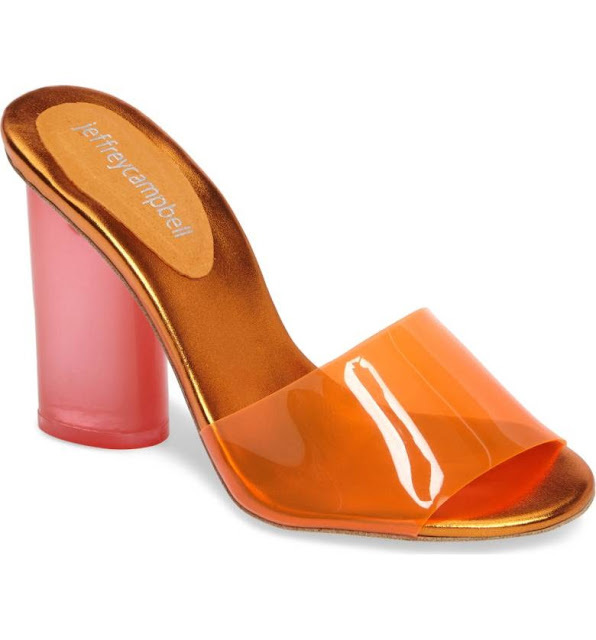 We've still got our focus on the fiery sun, so we love this Peggy Bundy-meets-Barbie-meets-2017 Minuit Mule by Jeffrey Campbell (available HERE) in all its orange glory. The slide silhouette, translucent toe strap and metallic footbed lend a 70s disco princess feel. Meanwhile a sculpted lucite column heel brings this sandal into the now. These shoes were made to stand out, just like you. Garnished with half a passionfruit floated in the drink. 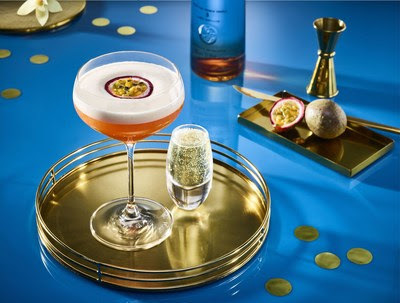 Add all ingredients except for the champagne to a Boston tin with ice, shake and fine strain into a large martini glass. Serve champagne in a separate shot glass. As always, we must insist that you indulge responsibly and legally. Also, we'd love to know your thoughts on these shoes and this drink. If you have shoes you'd like paired with a cocktail, we're at your service!